We suggested yesterday that we were likely due for some regression and that’s what we had last night, dropping our Best Bet on the Sharks/Canadiens Over and going 2-4 on our leans. Hopefully we’ll get right back on track today as there are 10 games in the NHL. We’re getting this post up early today as two of the games are afternoon starts. We probably won’t post anything to our site tomorrow but we’ll be back Monday. Good luck and have a great day. Not much time for a long writeup here, but we don’t like the way the Blues are playing defensively right now (3 goals against in 7 of their last 10). They’ve been scoring enough goals lately to overcome it, but that’ll be harder to do against a Blackhawks team that has held opponents to 1 goal or less in 4 of its last 5 games. This price on Chicago looks too attractive to pass up, especially considering they’ve won 3 straight games and have already beaten St. Louis in their own rink this year. Reasons to bet Philadelphia: The Flyers have won an NHL-high 10 straight games. Dallas has 3 wins in its last 10 outings. Reasons to bet Dallas: The Stars are 8-5-2 at home and have limited their opponents to 2 goals or less in 5 of their last 7. Reasons to bet Arizona: The Coyotes have actually won 3 of their last 4 games. Arizona is giving up a ton of shots, but other than a 7-0 loss Monday in Pittsburgh, they’ve allowed 5 regulation time goals in 4 games. Reasons to bet Minnesota: The Wild has won 6 straight, including an impressive 5-2 win in Nashville Thursday. Arizona’s 5-9-3 on the road while the Wild are 10-3 at home. Reasons to bet Pittsburgh: The Penguins had won 7 in a row until last night’s 1-0 loss at home to the Kings. Toronto has lost 6 of 7 overall and 4 straight at home. 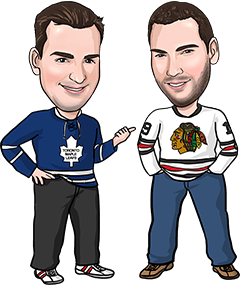 Reasons to bet Toronto: The Leafs have held their opponents to 2 regulation time goals or less in 6 of their last 9 games. Pittsburgh is playing its 4th game in 6 days and is just 7-5-2 on the road. Reasons to bet New Jersey: The Devils have won their last 4 games against Ottawa. The Senators’ defence has been shaky lately, allowing 4 goals or more in 4 of their last 5 games. Reasons to bet Ottawa: New Jersey’s been even worse defensively of late, allowing 19 goals in its last 4 games. The Devils have given up 4 goals or more in 6 of their last 7 games, and 8 of 10. Reasons to bet Montreal: The Canadiens should want to atone for a disappointing effort last night at home to San Jose, when Montreal fell behind 3-0 in the first period. Reasons to bet Washington: The Capitals won their 6th straight game last night in Carolina and have scored 3 goals or more in each of those wins. Montreal has lost 6 of its last 8 road games. Reasons to bet Buffalo: The Sabres beat the Islanders 3-2 in OT last night to improve to 5-2-1 in their last 8 games. Carolina has lost 6 of its last 9. Reasons to bet Carolina: The Hurricanes are 7-0-1 in their last 8 home games and have scored 3 goals or more in 5 straight games. Buffalo’s allowed 3 goals or more in 7 of 9. Reasons to bet Anaheim: The Ducks are 4-1 in their last 5 games, and have won 5 of their last 6 meetings with Detroit. The Red Wings are 2-12 in their last 14 at home. Reasons to bet Detroit: The Red Wings should be desperate to get a home win before playing 10 of their next 11 on the road. Anaheim has allowed 3 goals or more in 5 of its last 7 games. Reasons to bet New York: The Rangers have won 4 of 5 games, allowing just 3 goals in that span. Nashville is slumping, with 2 wins in its last 7. Reasons to bet Nashville: The Predators are one of the NHL’s best home teams, owning a 10-3-2 record at home. New York has been held to 2 goals or less in 5 of its last 6. Reason to bet Tampa Bay: The Lightning has won 5 of its last 7 meetings with the Oilers. Edmonton has dropped 5 of 6 games and has just 3 wins in its last 11 games. Reasons to bet Edmonton: The Oilers have won 4 of their last 5 home games against Tampa. The Lightning lost last night in Vancouver and has now dropped 8 of its last 10 games, allowing 3 goals or more in 8 of those contests.